Plumb the hidden depths of spring’s deep-sky by seeking out 3C 273, the optically-brightest quasi-stellar object (QSO) in the constellation of Virgo. Quasars are the intensely luminous centres of very distant and active galaxies, powered by a supermassive black hole. And don’t worry that you need a huge ‘scope to see it – a 15-cm (6-inch) instrument and a clear, moonless night are all you need. 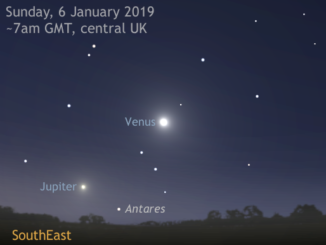 Find a location that offers you an unobstructed view of the southeast about an hour before sunrise in the UK over the next week to see dazzling Venus close to the horizon. 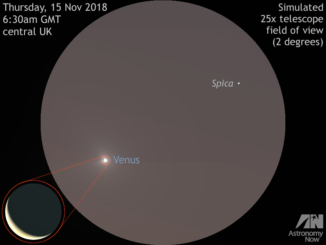 Look carefully at the planet around 6:30am GMT on 15 November and you’ll see it close to first-magnitude Spica, Virgo’s brightest star. 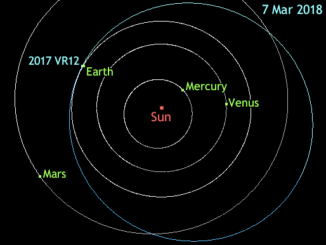 Possibly as large as The Shard in London, Apollo asteroid 2017 VR12 passes just 3¾ lunar distances from Earth at 7:53am GMT on 7 March. For a few nights, this magnitude +12 space rock is a viable target for small backyard telescopes as it gallops through Coma Berenices and Virgo, passing just 0.8 degrees from Spica on the UK night of 7–8 March. It currently pays to be an early riser if you wish to view the planets, for it’s all happening at dawn in the skies of Western Europe. 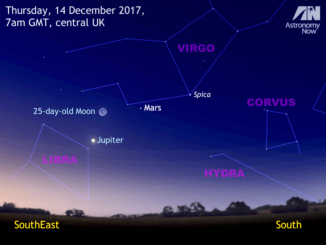 Find innermost planet Mercury, see a near miss of Mars and Jupiter on 7 January, then a fabulous binocular conjunction of the waning crescent Moon, the Red planet and Jupiter on 11 January! 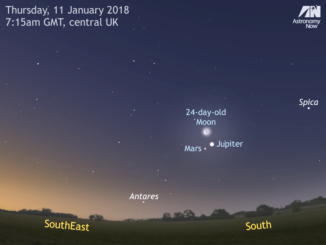 While looking for Geminid meteors, observers in Western Europe should also look to the southeast about 90 minutes before sunrise to see a beautiful conjunction of a 25-day-old Moon, Jupiter and Mars on Thursday, 14 December. 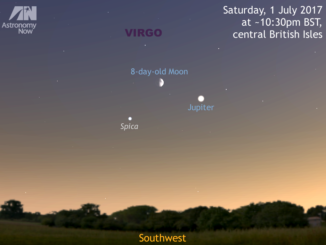 Observer’s in the UK and Western Europe should look low to the southwest an hour after sunset on Friday, 30 June to glimpse the almost first quarter Moon a low-power binocular field of view to the right of Jupiter in bright twilight. The following night finds the waxing gibbous Moon forming a near isosceles triangle with the planet and first-magnitude star Spica in Virgo. 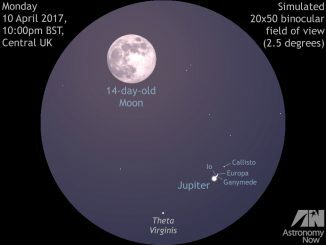 Despite more than seven weeks having passed since opposition, the Solar System’s largest planet Jupiter is still big and bright in the UK evening sky of May, highest in the south around 10pm BST. Find out about the phenomena of Jupiter and its moons that you can see from the British Isles for the remainder of the month, starting with a transit of Jupiter’s Great Red Spot on 19 May. 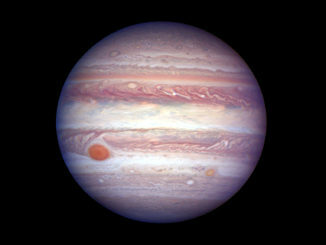 Jupiter, the Solar System’s largest planet, reaches opposition on the evening of 7 April and lies closest to Earth for 2017 the following night. Don’t miss the 14-day-old Moon passing close by on the night of 10 April too. Here’s our comprehensive guide to what to see on Jupiter and phenomena of its bright moons for the month ahead. Jupiter is now less than a month from opposition (7 April), so it’s very much open season for the Solar System’s largest planet. 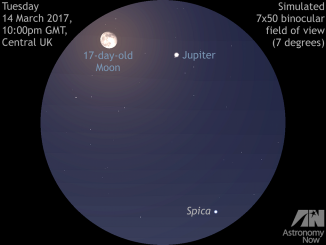 If you’re unsure where to find it, the rising 17-day-old waning gibbous Moon passes just two degrees from Jupiter on the UK evening of 14 March. 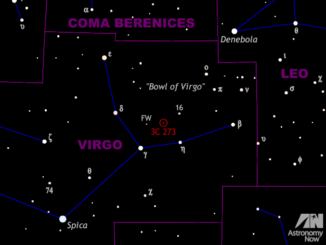 Virgo’s brightest star, first-magnitude Spica, makes it a great binocular triumvirate.